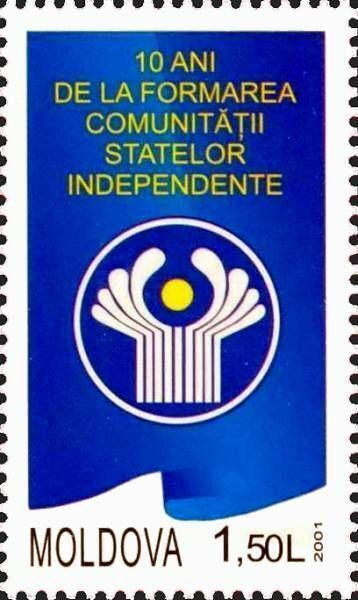 On 14 December 2001, the Post Office of Moldova (Poșta Moldovei) issued a postage stamp with the title 10th Anniversary of the Commonwealth of Independent States (CIS). The issue comprises one stamp, with an associated cancellation (postmark). No official first day cover (FDC) was issued. The designer was Iurie Derenji. The printing was performed by Bundesdruckerei, Germany. The Commonwealth of Independent States (CIS; Russian: Содружество Независимых Государств, СНГ, tr. Sodruzhestvo Nezavisimykh Gosudarstv, SNG) (also called the Russian Commonwealth) is a regional organization whose participating countries are former Soviet Republics, formed during the breakup of the Soviet Union. The CIS is a loose association of states. Although the CIS has few supranational powers, it is aimed at being more than a purely symbolic organization, nominally possessing coordinating powers in the realm of trade, finance, lawmaking, and security. It has also promoted cooperation on cross-border crime prevention. Some of the members of the CIS have established the Eurasian Economic Community with the aim of creating a fully fledged common market. Read more..